Where is the cheapest place to buy The Oracle Touch online? How does the Oracle Touch compare to the DeLonghi PrimaDonna Elite? Ebay can often be cheaper, so click for best price. No one likes waking up in the morning, especially on a cold dark day. The thought of a refreshing brewed cup of coffee can be just the incentive you need. But when you think of the burnt ashy tasting cup served in your local coffee shop instead of the creamy heaven you want, it’s depressing enough to send you right back to bed. Unless you are one of those super-rich people, who have enough money to hire a butler, hiring a barista to wake you up every morning with the sweet smell of coffee is just a fantasy. You could buy one instead though. Maybe not a living, breathing barista, but if your pockets are deep enough, then you can get yourself an Oracle Touch coffee maker, because honestly, it is as close to having your own personal barista as you can get! 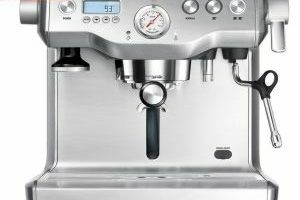 The Oracle Touch is a bean-to-cup coffee machine made by Sage & Heston Blumenthal in the UK and Breville in North America and Canada, and it makes the art of brewing a freshly made cup of coffee extremely easy, even to the non-initiate. And yes it’s an art only a few people ever get to master, usually only professionals. If you’ve struggled with a manual coffee maker in the past to get a cup of lousy tasting coffee, you will agree it is not as easy as it looks, but the Oracle Touch does all the hard work for you and helps you do it like a Pro. Amazon is currently the cheapest place to buy The Oracle Touch both online and on the high street. You can get 5% off right now, so save yourself £100 and get one whilst the offer is still on. 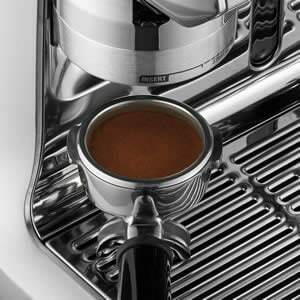 It automates all the little details of making a perfect espresso. You can adjust the dose, the water temperature, water pressure and even the steam pressure, and you get to control it all on a pretty snazzy touchscreen. Yea, it’s a coffee maker with a touchscreen. How sweet is that? 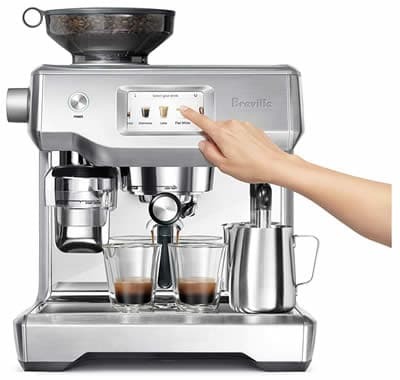 Breville/Sage’s Oracle touch does all the heavy lifting, all you have to do is pick which type of coffee you want. You don’t even have to know the difference between making a latte, cappuccino or a flat white. You simply select your favorite from the screen and watch the machine guide you through the process. For the coffee-head that knows precisely what they want, you can customise each cup to your specific taste, adjust the frothiness of the milk or the volume and strength of the coffee to taste. Take a look at this video guide which shows you exactly how easy it is to use the Oracle Touch and how each of the features work. 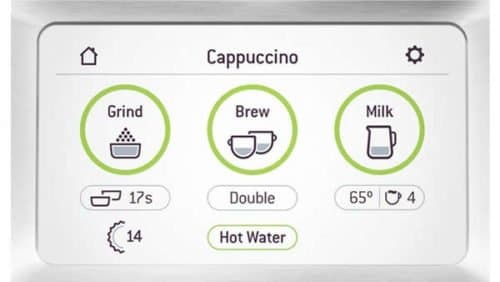 Whether you are using freshly-roasted coffee beans from the grocery store or more exotic well-stored Arabica beans, the oracle touch knows precisely what to do with them and can even advise you on what you to need to do to get the perfect cup with little skill at all. 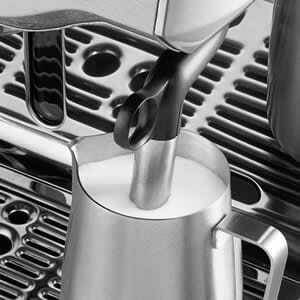 It can even adjust the grind for variables such as the grind size to make your coffee smoother. To start, you feed your beans into a hopper at the top. Then you attach the cup-shaped bit with an arm to the ground outlet then you nudge it slightly to the right. It’s called the portafilter, but you don’t even have to know what it’s called to use it. The grinding begins, and the ground beans run down from the burr grinder into the portafilter. 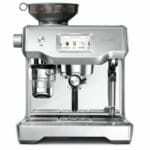 It has a tamping fan which does the work of smoothing off your ground coffee by applying a specific amount of pressure. You then move the portafilter with the ground coffee to the middle of the machine. Here the pressured hot water is added for that thick creamy taste. When you see how great the Oracle Touch is at frothing milk, you will fall in love with it instantly. No matter the type of milk whether full fat, almond or soya, It all works perfectly. Just place the jug under the frothing wand and select the kind of drink you want. The Oracle Touch gets down to business, and you don’t even have to wait around to monitor anything. It will froth the milk to the right consistency and switch itself off once it is done. The Oracle touch uses separate boilers for the coffee and milk which makes it easy to get enough pressure to create that ever elusive “micro-foam” only professionals seem to be able to make. You can get the creamy dense foam of a flat white or the lighter and frothier foam for a cup of cappuccino. This machine gives it to you with a touch of perfection. Its not all about technology, this beauty with the brains also has a lot of practical touches which are well thought out and makes day to day use just a little easier. From its classic wall plug which has a finger hole that makes pulling it out of the wall socket a total breeze, to its swivel foot, that makes gliding this gigantic 38 pounds heavyweight around on your countertop a piece of cake. Getting down to the intricate details of making a perfect cup is when you see how smart this machine really is. The dual boiler ensures the water temperature stays just right every time, which is important when a degree out either way can result in substandard coffee. Automated cut off temperature for frothing milk. Automated self cleaning of the steam wand using a pressurized blast out once frothing is complete. For the forgetful Tom that always leaves the drip tray for too long, there is a yellow “Empty Me!” sign that reminds you to do the needful. Inbuilt lights that light up the tank level indicator as well as the entire work area. Find best priceLike every smart gadget, a lot more is going on beneath the surface than you can actually see. When you place the milk jug under the frothing wand, the Oracle Touch knows just the right way to go about giving you a perfectly frothed drink. It measures the temperature of the milk and uses it to adjust for steam pressure. So your super chilled milk just out of the fridge receives a slightly different treatment than a warm jug of milk that has been sitting on your countertop for a while. And you will still end up with the same result, perfectly frothed, creamy goodness. After a while, you will be so used to the assistance you get from this machine that using a manual coffee maker will just sound ridiculous. Not that you’ll be able to serve it like a pro like you’ll do with the Oracle Touch anyways. Which is quicker at making a latte and which would you prefer to drink, given the choice? Watch the video and make up your own mind. No coffee machine is perfect and there are bound to be a few niggles or weaknesses, especially as it is subjective, everyone has their personal preference. And it might be the same with the Oracle Touch. To start with, it is quite bulky. And when I say big, let’s just say it’s the very first thing someone will notice when they walk into your kitchen. Although it is entirely possible to prepare custom drinks as well as the pre-set ones, you will have to repeat the process each time as you cannot save the custom settings. A problem that would have been easily avoided if they could make the machine capable of learning some cool new tricks for future use. Also, if you are a fan of a more participatory process where you get to turn some knobs and press some buttons, then this machine isn’t for you. Your experience with it will feel more like a robot is serving you your drink. The Oracle Touch is all clicks and swipes. No cranky parts or annoying buttons. You might have to rearrange your kitchen a bit before it fits in considering its hopper height. 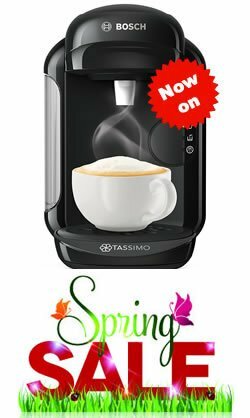 But given the price of this coffee maker, and how impressive it is, flaunting it is something you would definitely want to do. It looks fantastic and makes awesome barista quality coffee, literally at the touch of a button. You might also run into some issues when you want to update its firmware. While the firmware is available, you might find the extent you have to go to get it installed a tad uncomfortable. Believe it or not, but you have to send your Oracle Touch coffee machine to a service centre to get the firmware updated. 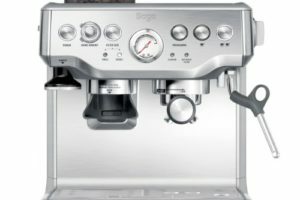 At a time like this, when almost everything is available online, not being able to update the firmware of a machine that costs $2,500/£1,900 over the internet is the least Sage/Breville could have done. Q) Can you get hot water on demand like you could with the original Oracle? Yes, exactly the same via the frothing wand. Q) Is a Lungo one of the pre-programmed choices? No, but you can programme it to make one. Q) Can you use pre-ground coffee? It is better to use beans and grind when needed as the oils released when you grind provide a better coffee taste. But saying that, you can use pre-ground coffee if you really want to, but you might want to take a look another model if you do not want to use a different grinder. Q) Does it tell you when it needs cleaning, descaling and filters changing? Q) Can it be plumbed for a direct water line? Q) Can you fit a 6-7 inch travel mug under the basket for takeout? No, you cannot, even if you remove the drip tray, as the handle is too low. However, I just make it normally and poor it into my travel mug, definitely worth the extra step for the trip to work each day. The Sage/Breville Oracle Touch is a perfect automated home coffee maker in our opinion. You are not going to be disappointed after tasting a cup of coffee made from this machine. Even if you are inexperienced at making coffee, you will have no issues at all at using this machine. Find best priceOf course, you have to love your coffee and appreciate fine design and technology to decide to spend $2,500/£1,900 on a home coffee maker. But if you can’t do without your morning coffee, and you want one with a professional touch. Then the Oracle Touch is undoubtedly an excellent choice.